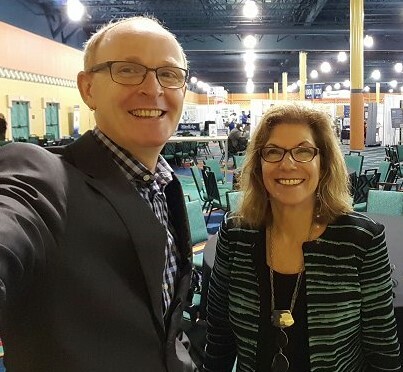 During PMI’s 2015 Global Congress, Elizabeth Larson, CBAP, PMP, CSM, PMI-PBA was asked to do an interview to discuss her paper and presentation “I Don’t Have Time to Innovate: I’m Too Busy Doing Business Analysis” (co-written with Richard Larson). Everyone seems to be talking about the importance of organizational innovation, as well as what it means for practitioners of business analysis. Are business analysis and innovation even compatible? This paper answers this question affirmatively: yes, they are. Cornelius Fichtner: Welcome back to Orlando, Florida. You are listening to the Project Management Podcast at www.pm-podcast.com. And we’re coming to you live from the 2015 PMI Global Congress. I’m sitting in the Exhibit Hall and next to me is Elizabeth Larson. Hello, Elizabeth. Cornelius Fichtner: Good morning. How’s everything? Elizabeth Larson: Everything is great. I really am delighted to be here. Elizabeth Larson: Happy to be talking to you. Cornelius Fichtner: So our key note this morning is all about innovation. You and I, we’re going to talk about innovation. This is a wonderful mind-meld here today. But my first question for you, what is the 2016 trend that you see coming our way? Elizabeth Larson: As far as project management is concerned, I see the fact that project management skills will always be needed. Whether we’re working on Agile projects, whether we’re working on traditional projects, we need the project management skills. But the trend that I see is more towards a distribution of the role. I see the titles are going to be less important so maybe the title of project manager will be less important in some organizations than it’s been in the past. But the skills will still be needed. So that’s the trend that I see. I see other people may be picking up parts of what we now might say as a project manager role. And I see that the project manager may be asked to pick up and do some other things, but the skills are still going to be needed. Cornelius Fichtner: Excellent. I Don’t Have Time To Innovate, I’m Too Busy Doing Business Analysis is the topic of your paper & presentation. Why this topic? What got you interested in it? Elizabeth Larson: I’m very interested in business analysis. And when I say business analysis, I do distinguish between business analysis and a business analyst by the way. So I’m talking about anyone that practices business analysis. I’m also very interested in innovation and its effect on organizations of all sizes. And I thought, this would be kind of a fun topic that, boy, some people think it’s an either/or thing. That either we’re doing business analysis, I’m so busy, I don’t have time to do anything else or I’m busy innovating. And my central theme really is, is that business analysis is about being a trusted adviser. And one of the key roles of a trusted adviser is to help organizations innovate. And so my paper and my presentation relate to that. And I think that’s a very important thing that we view ourselves as entrepreneurs, as innovators, even as we’re doing our project management work, as we’re doing our business analysis work. Cornelius Fichtner: I also asked Richard because his presentation is also about business analysis, what the relationship is to project management, because this is after all, a project management congress. Elizabeth Larson: Right. So it’s very clear to me that what we’re talking about again are the skills and techniques and characteristics of business analysis which is different from a business analyst. And there are many project managers who do business analysis work with that title, that sort of I was mentioning before that title of PM but they do business analysis work. There are others that are project managers who have people who do business analysis work. BAs, business analysts who work for them. The project manager, whether or not, they actually do the business analysis, they have to understand at least at a high level what it’s about and what’s involved and to encourage the BAs to go about if they again have BAs working for them. To go about looking for ways to help the organization innovate. Cornelius Fichtner: All right. Can you give us a high level definition? What is business analysis? Elizabeth Larson: Sure. Business Analysis, and I really loved this, and basically, it’s about enabling change in an organization. And the way that’s done, and this is also from the PMI Pulse of the Profession from 2014 with client’s management, that it is to determine business needs. So what are the business problems and opportunities that need to be addressed and then recommending viable solutions to address the business needs. So what are the problems? What are we going to do about them? But they have to be viable. They have to help the organization grow and the PMI Pulse of the Profession definition says to meet business projects and objectives. So if you think about that definition, I’m going to find out what are the problems to be addressed. I’m going to recommend viable solutions that enable change in an organization, that provide value to the organization. That’s what trusted advisers do. That’s what entrepreneurs do, that’s what innovators do. And I’m just fascinated by the integration of the definition of business analysis and how that helps organizations innovate. Cornelius Fichtner: And I’m really sorry now that we don’t have a video podcast because your hand signals really make it come to life. Okay, next, we also talk about innovation. Can you give us a quick definition of what is innovation? Elizabeth Larson: So the definition that I used for innovation comes from www.businessdictionary.com. And that is, that innovation is the process of translating a new invention, a new idea, anything in between, into goods or services that provide value, that create value, that customer service you’re willing to pay for. So that’s the definition, okay. So it’s that translation process because we could have a lot of great ideas, innovative ideas in our head but we have to do that translation into goods or services that people are willing to pay for. Cornelius Fichtner: Why? Why should we innovate? Elizabeth Larson: Well, it’s really interesting to me that there’s so many organizations think that it is the magic board. It’s going to save them, it’s going to provide growth in their organizations. But, of course, they struggle. Maybe we could address that later. Why should we innovate? I honestly believe, that again given the definition that I talked about. It’s a new idea, it doesn’t have to be total disruption. It can be a new idea; it can be something radically new. But if we don’t try new things, I believe we’re going to stagnate. We can’t continue. The business world is changing so rapidly and we have to respond and we have to figure out a way to change, to innovate, without disrupting completely organizations and again, enabling that change in the organization. But if we don’t innovate, if we don’t change things, I don’t see how we’re going to be able to respond, to grow. Our organizations are not going to be around, it seems to me. Cornelius Fichtner: You know, our keynote this morning, we heard how Lego really struggled as they were innovating. So let’s talk about the reasons for struggle. Why do companies struggle when they innovate? The complete transcript is available to PM Podcast Premium subscribers only, or listen to the podcast.